I am Christmas Carol and I am an anti-craftite. I was born on Christmas Day so I am a bit obsessed with all things Christmas including personalized dog gifts. That said, I am that woman in craft stores who spends $80 dollars to make something that ends up looking like a gluey oozy mess. Yet, I try. I have an inner crafter hidden somewhere inside of me, so I channel that crafting guru into personalized dog gifts. Hurrah for that list, right? Off we go, let’s have ourselves a personalized dog holiday!!! 1. An empty glass jar in a size of your choice. 2. A glue gun: I purchased one for $4.99 at a craft store chain. 3. Some cute ornaments, hearts, or anything resembling a snowball shape. 4. A dog bone cookie cutter (nod to Jodi, I was able to work in the cookie cutter for something). 5. A string of battery operated white lights. Directions are pretty simple: Drop the ornaments into the jar, spread the lightstring throughout, top with the lid, decorate as desired, and wrap a cute dog bone cookie cutter around it. For $25 bucks I just made an adorable gift or something that looks cute in my home office. When PetSmart®recently had a sale on dog water bowls, I jumped at the opportunity to turn that bowl into a cute ornament holder for my office. The total cost? $5 bucks for the bowl plus $3 for the ornaments at my local Target store. Ta-da! What dog parent wouldn’t love to receive this? They can keep the ornaments and upcycle the bowl for their dog or keep it displayed as is. Long-time readers of this blog know I am far from a chef. In fact, when your spouse nominates you for Worst Cooks In America television show, you know you have culinary shortcomings. That said, doesn’t the sound of homemade and easy-to-make pumpkin dog treats sound yummy? We recently blogged about the Bewitching Powers and Dangers of Pumpkin for Dogs. Any pet parent I have gifted with a first aid kit has thanked me time and time again. I even get a card or an email when the gift is first used. No one ever wants to think that their dog could get injured, but life happens, and it’s best to be prepared. 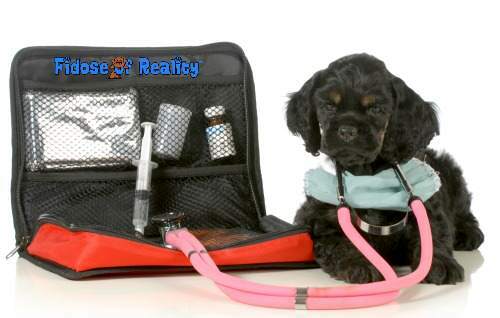 You can snag any number of reliable pet first aid kits in a variety of places, but there are some items that most likely are not included. At this time of year, totes and bags are on discount due to the holidays, so fill one that fits easily into a purse or glove box of a vehicle. I received a lock of fur ornament many years ago from a dear friend. Inside this beautiful hand-painted ornament was a lock of my belated Cocker’s fur. The ornament was topped with a bow, and I am forever grateful I have it. My friend asked for a lock of fur after my dog was groomed. I mailed it to her and forgot about it, since she said it was for a gift. The joy I receive in placing that ornament on my tree every year is worth its weight in gold. If you aren’t a talented painter, as I am not Picasso, you can even purchase glass ornaments and some cute etched-type stickers at the craft store to apply. Insert the dog’s lock of hair and tie it off with a bow. I am all about pictures. Pictures make the house a home. Pictures also make a Christmas tree sparkle with memories. Here are a few of my favorite personalized ornaments. I simply upload my phone photos to my computer, send the images over to Walgreen’s or CVS, and I pick the prints up in an hour. For 10 cents a pop, I have a cute ornament. In this hectic day and age of electronic everything, people still love holding and seeing an image in the palm of their hand and on the branch of their Christmas tree. If you are looking for a last minute idea, consider our My Heart Beats Dog ornament. Gift yourself or another dog lover with a small mixture of ornaments or pair it with the Santa’s Bowl of Ornaments we discussed earlier. Jingle Bells! Who else loves receiving tangible hold-it-in-your hands paper cards like I do? This is where my passion for dogs shines! Here are 50 dog-themed holiday card ideas. You can certainly find a cute personalized dog holiday card here. Bonus: Many people frame holiday cards, especially if their dog is included! Frosty doesn’t need two arms after all. Get further inspired and click on over to our pal Jodi at Kol’s Notes. No doubt, between this list and hers, you’ll have a personalized dog holiday the likes of better Paws and Gardens. Are you shopping for your dog this holiday season? Do you like to give and/or receive personalized gifts? Tell us in the comments below. We’ll pass the word on to Santa Paws. These are some great ideas! I love getting personalized gifts! I also love to give them, except I’m such a procrastinator that it is stressful to make them in the time I have left. Now those are some great ideas! Miss Edie and the cats wouldn’t forgive me if they didn’t get a present under the tree! I’m not a crafter but I do like the idea of the photo ornaments! Personalised dog biscuis!! The ultimate luxury for any pup!!! Honest to Pete, there are so many things we love here we will go shopping!!! Great list of things! Alas I am also not crafty. I’m making a pawprint ornament later this month… I’m kind of afraid I’m going to mess it up. I am with you – I am not very crafty. The pawprint ornaments are easy and you will rock it. Oh I am so with you in the crafting department. Glad you liked these.